There is one post tagged marketing. For ages I wanted to have blog where I can discuss about my work, technology, crowd sourcing, social networking and many other things. I have a blog, living the dreams where I post photos and random musings on various topics and write ups in Malayalam which is my mother tongue. Now since I am doing only those things I wanted to do – yea, no more XML embedded Java, no more disappointments hearing the feature you worked your a*s off got scrapped, fixing GUI labels of an NMS product even though everyone knows I hate GUIs and my skills can be put to better use, no more switching between desktops and laptop running OSes which I can’t bear, no more fooling around century old technologies – I thought this is high time to have a technical blog or a English only blog. I have been monitoring technical blogs some are pretty useful and others are ‘generated’ based on which popular keywords have enough search volume but not much relevant content. The biggest incident of recent times was the mysterious death of the great pop star Michael Jackson. I came to know about the news 2 days after the incident as I was busy with a project release and I was equally shocked like the rest of the world but never got time to watch TV – Oh, I don’t own a TV and haven’t seen TV in last 9 months or so – search in Google, search in Bing and see how the results vary etc. I have never seen him or I have never taken a photo of him. 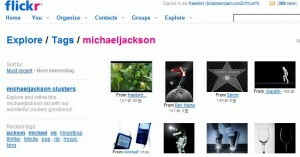 But as of today I have the most interesting Micheal Jackson photo as per Flickr and third most popular Michael Jackson photo as per Technorati. The trend of recent times is crowdsourcing or make the crowd work free for you make profits out of it. The latest example could be Chrome OS where the big G will probably make use of Firefox and Google Gears to perform everything that was traditionally performed by complicated GUI APIs. The man hours that was spend for developing Firefox is now helping giant corporations ! (yes, its high time for the FOSS community to unite !) User generated content and social networking is the manthra for the day. Even the prOn industry is getting hit by the social networking sites. Among many things I will try to write about is crowd sourcing and marketing using the same. Oh, yea I am not bad at it because I have world’s most popular Micheal Jackson Photos at the moment – even though I have never seen or shot him ! In short, what if I had a sellable commodity in place of those images ? In today’s knowledge centric world, one who has ideas and one who can implement them wins. disclaimer: the photos used in this post has nothing to do with Michael Jackson. They are used as a way to analyze the interenet search trends and how to cash them.